Liberal Leader Kathleen Wynne, shown speaking to the media in Sudbury, Ont., has the lowest approval rating of any Canadian premier, but she tries not to take too much stock of what the polls say. ‘I have a thick skin,’ she said in an e-mail to The Globe and Mail. 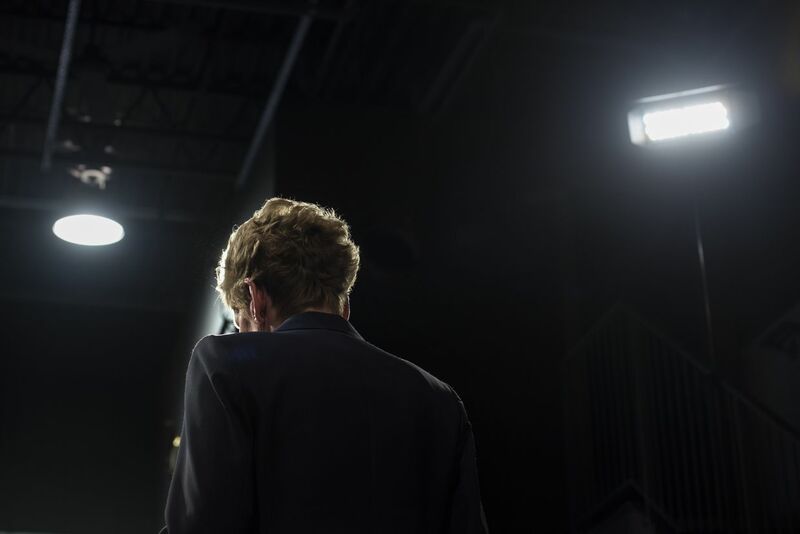 The blunt new ad released this week is an acknowledgement that there is deep resentment toward the Ontario Liberal Leader across the province. Ms. Wynne is no longer dancing around the central issue in her campaign – she is telling voters she hears the message. After 15 years of Liberal rule in Ontario, the party knows it is facing an immense clamour for change from a weary electorate. But what still surprises many is the level of visceral dislike aimed at Ms. Wynne herself, which has become a major obstacle in the campaign. Some Liberal candidates are running without using her image or name on their signs or in campaign materials. Some aren’t even putting the word Liberal in their materials. The depth of the personal dislike for Ms. Wynne is evident in a recent poll by Abacus Data aimed at gauging emotional reactions to the three main party leaders, which found only 18 per cent would want Ms. Wynne – a 65-year-old grandmother of three – to babysit their kids, while 68 per cent would trust New Democratic Party leader Andrea Horvath with the job. Only one in five believed Ms. Wynne would lend them $20 if they needed it. Almost twice as many thought Progressive Conservative Leader Doug Ford would be more likely than Ms. Wynne to stop and help if their car were broken down. Mr. Ford even had a small lead when people were asked who would be likely to spend a day volunteering at a food bank. “There is something raw and instinctual with people’s reaction to anything related to Kathleen Wynne,” Abacus Data CEO David Coletto says. The aversion to Ms. Wynne is long-standing. For almost two years now, she has been Canada’s most unpopular premier, her approval lower than Donald Trump’s or even Richard Nixon’s in the wake of Watergate. But the depth of apparent anger feels out of proportion to her failings, says University of Ottawa political science professor Geneviève Tellier. Since the 2014 election, the province’s economy, normally a bellwether of a premier’s popularity, has done exceptionally well: GDP growth has been the second best of any province except British Columbia. Ontario has gained 335,000 new jobs, and unemployment has fallen from 7.4 per cent in June, 2014, to 5.5 per cent in March this year, again second only to B.C. The explanations offered by Liberals, their opponents, pollsters and academics point to a mix of factors: fatigue with a decade and a half of Liberal rule; disappointment that Ms. Wynne did not deliver the reboot expected on the heels of former premier Dalton McGuinty’s resignation; personality traits that simply rub voters the wrong way; and high levels of anger over a few hot-button policy issues, most notably rising electricity prices – off-peak rates climbed 149 per cent between 2006 and 2017 – and a controversial decision to privatize transmission-line giant Hydro One Ltd., whose power lines supply electricity to 98 per cent of Ontarians. Some are also convinced that deep-seated biases may be the final ingredient to explain the strength of the emotions. Ms. Wynne is not only a powerful woman in a leadership role, but is also a proud lesbian, both providing potential fodder for discrimination. For her part, Ms. Wynne says she is not blind to the fact that people “have thoughts about my personality or my appearance.” But she tries not to focus on such personal attacks. Ms. Wynne chats with members of the media aboard a chartered plane on a day of campaigning from Toronto to Northern Ontario and back. Globe photographer Fred Lum accompanied her on the journey. Ms. Wynne started her day at the Metro Toronto Convention Centre, where she made an announcement about transit. The Liberals’ 2018 budget promised $79-billion for various transit projects in Toronto, Ottawa and Windsor over 14 years. 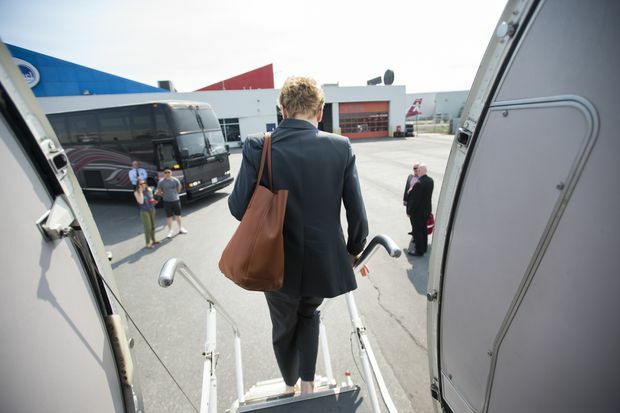 Ms. Wynne heads back to the campaign bus after the event at the convention centre. Toronto and Eastern Ontario are two of the areas where Ms. Wynne’s polling numbers are strongest. 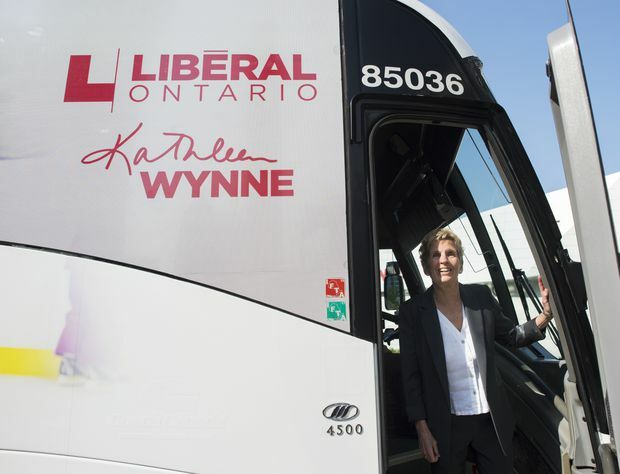 After the Toronto event, the Liberal Leader set off for Sudbury and Thunder Bay to shore up support in the province’s north. There is no doubt Ms. Wynne is carrying baggage inherited when she won the party leadership in 2013, following the resignation of Mr. McGuinty. Weighing most heavily was a scandal surrounding the undisclosed major cost of cancelling construction on two locally unpopular gas-fired electricity plants located in pivotal ridings. The Liberals won a majority in the 2014 election, helped by major gaffes during the campaign from PC Leader Tim Hudak. But they garnered just 38.7 per cent of the popular vote, giving Ms. Wynne a weak foundation of general support despite earning a nine-seat majority. Individual scandals aside, pollster Lorne Bozinoff, CEO of Forum Research Inc., says it is almost unheard of for a party to stay in power for 15 years in the current political era. The Liberals may have been on “borrowed time,” he says, after the last election. Jan. 28, 2013: Ms. Wynne gets a kiss from outgoing premier Dalton McGuinty after a transition meeting at Queen’s Park. Ms. Wynne was supposed to represent a break from the past after Mr. McGuinty’s resignation, a fresh face who was not part of his inner circle. But after her election in 2014, many of Mr. McGuinty’s most prominent ministers – including Charles Sousa, Deb Matthews, Bob Chiarelli, Eric Hoskins and Brad Duguid – still filled most of the prominent cabinet positions. There was also little clear break from Mr. McGuinty’s policy approach – especially on the contentious electricity file – in her early years as premier. Ms. Wynne also struggled to break away from the gas-plant scandal, which led to criminal charges in 2015 against two of Mr. McGuinty’s former staffers, who were accused of deleting e-mails as the scandal deepened. Mr. McGuinty’s chief of staff, David Livingston, was convicted only this past January and sentenced to four months in jail in April, a timeline that meant the issue remained fresh in the public’s mind throughout Ms. Wynne’s entire term. Liberal Party strategist John Duffy, who is informally advising the Liberals in the current campaign, believes Ms. Wynne has been substantively different from Mr. McGuinty, especially with her emphasis on social programs such as free daycare and free drugs for seniors and young adults. But, he says, the public felt it saw no change in the “tone and feel” of the government, which is as important as the content of policy initiatives. “I think the continuing same faces and the continuing same look and feel of the government had the effect of creating continuity with the previous government, and that has taken us back to square one,” Mr. Duffy said. Ontario election day is coming on June 7. Get caught up here with The Globe and Mail’s latest coverage. Ms. Wynne’s competent, no-nonsense persona has also become a target of attack, a trait that has allowed savvy opponents to paint her as a finger-wagging prig. It’s an image that warms few hearts. At a televised debate in early May, the party leaders faced a question from a woman whose brother was shot by a police officer, and who asked about funding for police training. Ms. Horwath and Mr. Ford began their replies by expressing their condolences. Ms. Wynne first praised the successful arrest of the suspect in Toronto’s recent van attack, then explained her government’s funding actions. Her answer was the most substantive, but the least sympathetic. 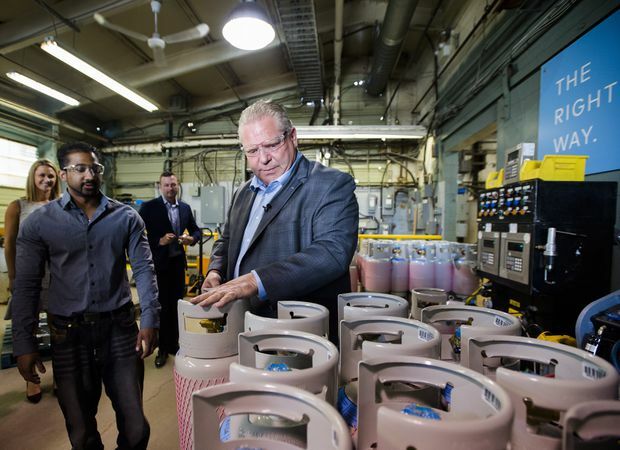 May 16: PC Leader Doug Ford tours Fielding Environmental in Mississauga. Mr. Ford charges that the Liberals are an “elitist” party. Ms. Wynne also faces daily accusations from Mr. Ford that she and the Liberals are “elitist,” a party of Toronto intellectuals that has favoured their similarly minded friends. The accusations have persisted even though Ms. Wynne has unveiled numerous policy announcements squarely aimed at lower-income earners. Over the past year, those have included plans for free daycare for preschoolers, a higher minimum wage, expanded rent controls to protect tenants and drug coverage for seniors and people under 25. In the current school year, more than 225,000 college and university students received free tuition under a new program aimed at lower-income families. The Liberals have angered so many categories of voters, he says, that even if people support a particular policy initiative, they are angry about something else. Others say Ms. Wynne’s last-minute veer to the left smells like desperation. Mr. Lyle says many voters have grown cynical about being offered a shopping list of promises. May 14: NDP Leader Andrea Horwath makes a campaign announcement on health care in Brampton, Ont., part of the suburban 905 region where Ms. Wynne is fighting perceptions that she doesn’t care enough about non-Torontonians. In the suburban 905 region outside Toronto, in the manufacturing heartland in Southwestern Ontario and in the poorest communities in Northern Ontario, Ms. Wynne is haunted by a perception that she doesn’t care about people outside Toronto. Leslie Noble, a long-time PC party strategist who is now a principal at public-affairs consulting firm StrategyCorp, believes downtown Toronto is so obviously booming that people living there – including Ms. Wynne – don’t fully grasp the weaknesses in regions where thousands of manufacturing jobs have disappeared. “There’s a significant feeling of economic alienation out there,” she says. And yet, many of Ms. Wynne’s more progressive social policies are not resonating outside the areas in which she’s polling strongest: Toronto, and Eastern Ontario (home to an economically robust Ottawa). The narrative of blinkered urbanism has persisted even as the government has rolled out announcement after announcement of funding efforts to support job growth, particularly in the manufacturing belt in the southwestern part of the province. The central initiative of those efforts is the $3.2-billion Jobs and Prosperity Fund. Launched in 2014, it offers companies grants or loans worth 20 per cent to 40 per cent of their project costs and includes separate funding programs for different regions of the province. Many of the biggest of those have gone to the major auto makers and to vehicle-parts companies, including Guelph-based Linamar Corp., which received up to $50-million. But while the government says the program is “creating and retaining” 70,000 jobs, many far outside the Greater Toronto Area, it has not restored manufacturing to its past strength, and certainly cannot turn every struggling factory town into a new-economy tech hub. In any case, policies that put money in the pockets of companies don’t necessarily resonate with individuals just working to get by. Mr. Lyle, of Innovative Research, says that the people angriest with Ms. Wynne are the “struggling strivers” – people who believe strongly in the Canadian dream of success but are struggling to get by. Among that group, only 11 per cent said in a March poll that they are most likely to vote Liberal, while 60 per cent say they will vote PC. In the suburban 905 region outside Toronto, he says, many do not feel Ms. Wynne understands their struggles to get ahead. Some more recent polls also show the NDP pulling even, or ahead, in the 905 region, as certain voters come to see Ms. Horwath as sympathetic to their struggles. The economic gap between Ontario's thriving and struggling towns is dividing the province politically. Matt Lundy, Justin Giovannetti and Ian McGugan explain how. Ontario saw electricity rates rise rapidly after 2006, because of two factors: past policy decisions to spend large sums on upgrades to the electrical grid (which led to overbuilding of capacity); and costs from long-term, fixed-rate supply deals with private companies. By 2017, anger about soaring electricity bills forced Ms. Wynne to unveil a plan that included substantial rebates, reducing bills an average of 25 per cent and capping increases at the rate of inflation for four years. But it may have been too little – or at least too late. A May Ipsos poll for Global News showed that electricity pricing was the fourth-biggest issue driving voting choice, after health care, the economy and taxes. 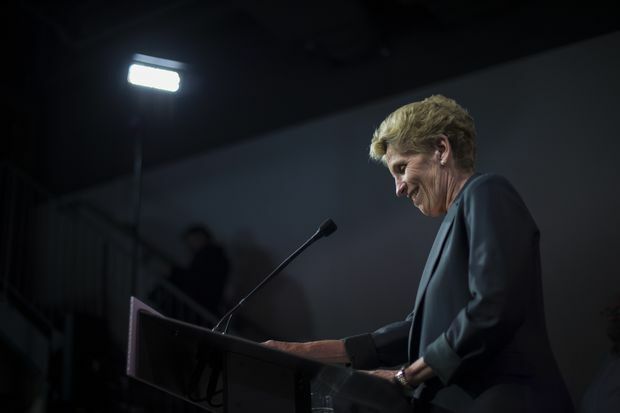 Ms. Wynne also faces continuing attacks over the province’s decision to privatize transmission utility Hydro One in 2015, gradually reducing Ontario’s ownership stake to the current 47 per cent. Mr. Ford has pledged to replace the company’s entire board and force out CEO Mayo Schmidt, calling him the “$6-million man” in reference to his annual compensation package, and arguing that excessive executive pay is driving up electricity prices. While Mr. Schmidt’s pay has no direct impact on retail electricity prices, and is set by the company’s independent board of directors, the resonance of Mr. Ford’s claims have drawn Ms. Wynne and the Liberals into the fray. The province cannot directly change compensation, but the government has complained to Hydro One about its pay policies, and said it is launching a review. Hydro One’s board also launched its own review of compensation in late April. Ms. Wynne is also facing anger from voters who do not want to see the province return to budget deficits to pay for the flurry of social programs she has announced over the past year, including the new daycare plan unveiled in the March budget. Deficits are a hot political issue in Ontario. Under Mr. McGuinty and then Ms. Wynne, the government unveiled nine consecutive deficit budgets following the 2008 financial crisis. Then, in the 2014 election campaign, Ms. Wynne pledged to balance the budget by fiscal 2017-18, and to start to pay down debt. She met that goal, unveiling a balanced budget last year. But a host of new spending promises over the past year forced the Liberals to announce, in its March 28 budget, an anticipated $6.7-billion deficit for 2018-19 as well as future deficits through to 2024-25. 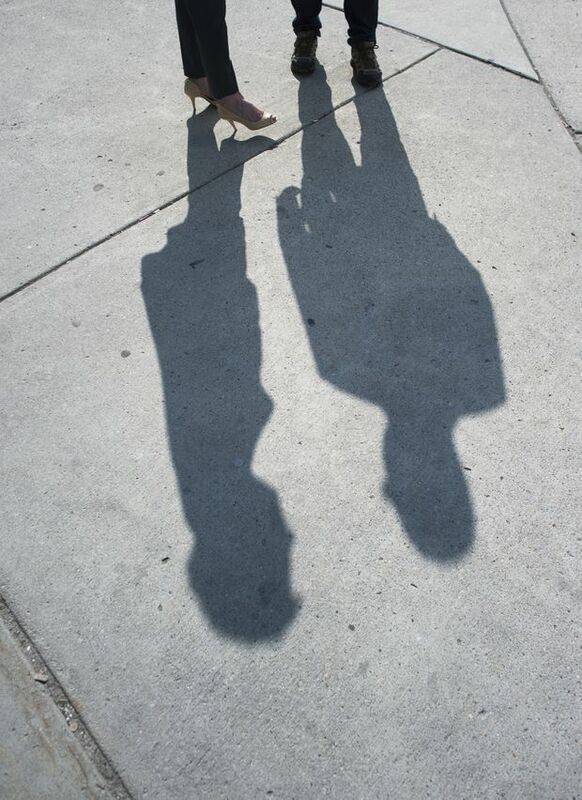 May 23: Ms. Wynne, left, and a member of the public cast shadows as they talk in Toronto. As premier, Ms. Wynne has had to endure sexist comments on social media, which her supporters present as evidence she’s being treated more harshly than other leaders. It’s not easy to measure the role sexism plays in Ms. Wynne’s personal-approval rating, but supporters point to research that shows women in senior leadership roles are often judged more harshly than men, and are not easily forgiven for their mistakes. Canada has seen only eight women ever elected as provincial premier, and only one of them, B.C.’s Christy Clark, has ever won a second term – a minority victory last May, followed by a non-confidence vote and the fall of her government the following month. Liberal Party member and volunteer Tiffany Gooch has helped co-ordinate a social-media group called Women for Wynne, and recently posted a video on Facebook that shows examples of profane and sexist online comments aimed at Ms. Wynne during her time as premier. She has also drawn on information from Ms Wynne’s social-media accounts to estimate that “hate tweets” and death threats to her have tripled over the past 12 months. Hillary Clinton faced a sophisticated wave of sexist social-media attacks in the last U.S. election campaign, demonstrating the potential impact of grass-roots opposition campaigns. Ms. Horwath, who has never been elected as premier, has also faced sexist commentary, but is far more popular and appears not to be targeted with as much vitriol. Ms. Wynne is also openly gay, and has been married to her partner, Jane Rounthwaite, since 2005, providing more potential fodder for discrimination and online attacks. But pollsters say sexist attitudes toward Ms. Wynne are hard to measure; for one thing, few people will admit to them. What is measurable: the big divide between her support, during the campaign, among men and women, particularly when it comes to voters over the age of 45, where men overwhelmingly prefer the Tories and women are more evenly split among the three parties. Still, Mr. Bozinoff, for one, says the gender divide can, at least in part, be explained by the fact that women are more attracted to many of Ms. Wynne’s policies, such as free daycare. “I don’t think it’s a simple thing of men voting for men and women voting for women,” he says. Mr. Lyle, of Innovative Research, argues Ms. Wynne may even benefit from being a woman. 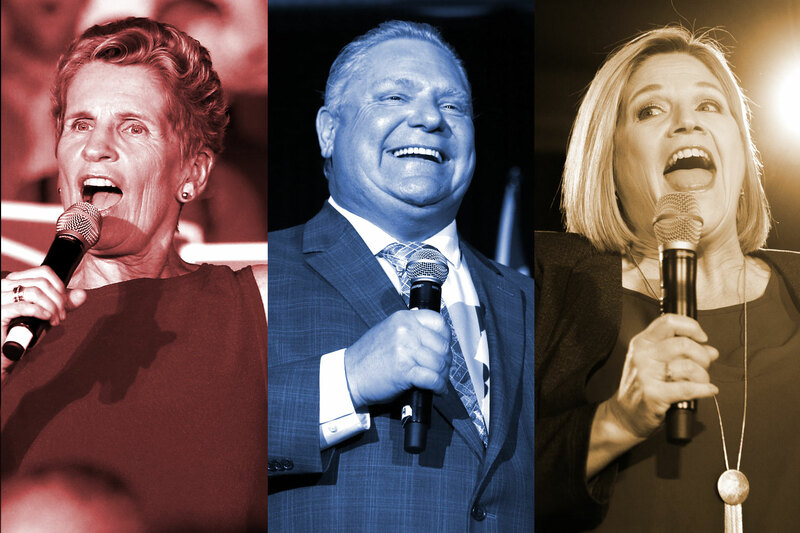 A poll he did last October found that supporters of all three parties who identified as “strongly feminist” were more likely to agree that Ms. Wynne has changed things for the better in Ontario. He says that may mean Ms. Wynne garners support from some feminist voters who would not give the same break to a male leader. “The bottom line is that there’s not a prima facie case that she’s being judged so harshly because she’s a woman,” he argues. After a flight from Toronto, Ms. Wynne, reflected in distillation equipment, pays a visit to Crosscut Distillery in Sudbury, where she talked about jobs in Northern Ontario. 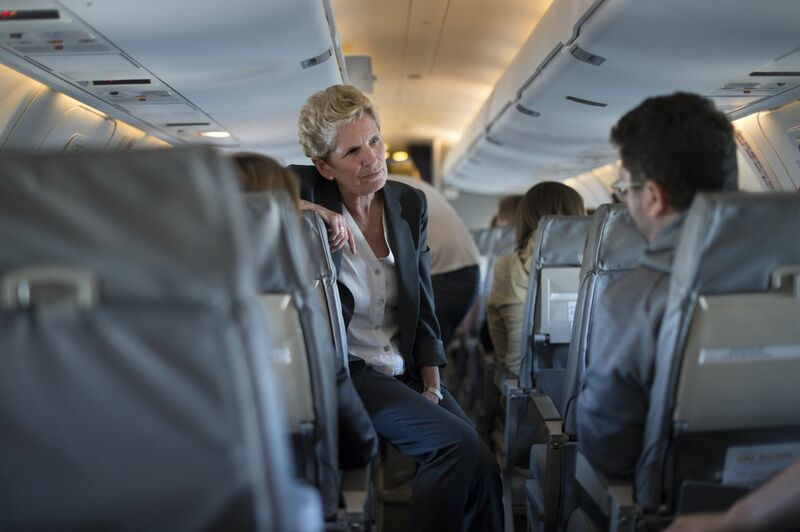 Another flight on a chartered plane brings Ms. Wynne to Thunder Bay for a rally with candidate Michael Gravelle. Ms. Wynne greets a Liberal supporter at Mr. Gravelle’s campaign office. Ms. Wynne’s difficult challenge in the final weeks of the election campaign is to change firmly held beliefs about her leadership. Still, Prof. Milloy says he is surprised by the harshness of the personal attacks on Ms. Wynne, and struggles to explain why she is so strongly disliked. He chalks up much of her unpopularity to simple voter fatigue after all the years of Liberal rule. “The narrative has been presented that they waste money, they are scandal-ridden, that hydro rates have gone through the roof and we pay the highest hydro rates in North America – which we don’t,” he says. Perhaps Ms. Wynne’s best hope is that Mr. Ford makes a major blunder, and turns away softer elements of his support. Even then, voters seem more eager to flow to Ms. Horwath, allowing the NDP to split the left-leaning vote – or come up the middle on election day. Mr. Coletto believes the Liberals need to break through the personal hostility toward Ms. Wynne to get people to listen to the substance of her policies. The party has been crafting ads that play down images of the leader, and that focus instead on comments from regular people.